Plant this; water that; transplant this; close the cold frame it’s going to be cold tonight; in between all of the things that need to done, I manage to take time to be excited by little things that most visitors to my garden might miss. 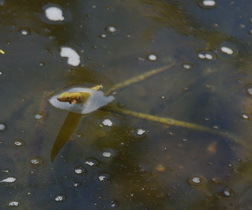 There is a single tightly curled leaf emerging in the lower pond. The big pot in the corner had my struggling but expensive Lotus in it last year and that’s where the lone leaf is emerging from. The Lotus survived the winter! That’s one of those little things that make the garden special for me in the spring. Pardon the layout again; they still haven't fixed the program. 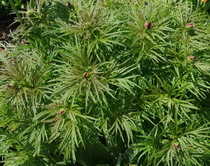 Garden Treasure, the Itoh hybrid Peony has made its much anticipated appearance. It has at least five strong stems surging upward and hopefully at least one of them will throw a large brilliant yellow bloom. It was actually there before but I was searching on the wrong side of the label stake. 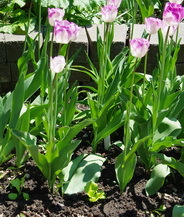 On the other side was a mass of foliage from the autumn blooming Crocus that was hiding the emerging stems. Out front Little Red Gem, my fern leaf Peony, has been showing colour out of its buds for a few days and any day now it should pop open its small single red flowers. On the berm at the back of the garden the amazingly sweet fragrance of the Viburnum in full bloom, fills my nose. 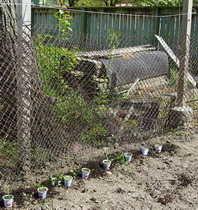 Today I planted out the Sweet Peas that I have been growing in my yogurt containers. A row of netting hung out a few inches from the East fence and a dressing of composted manure and we will see how they develop. I planted some Sweet Pea seeds along with the Sugar Snap Peas to see how they do when grown directly from seed and to continue my mixing of flowers and vegetables to make the whole garden more interesting. All of the cruciferae have been planted and the Rapini is already showing flower buds and should be ready for a light steaming and a touch of butter in the next few days. I have tucked a variety of lettuce in between the delightfully blooming Tulips and that should produce some nice salad as the Tulips fade and disappear. The hard part now is to wait. The weather feels warm, but last night and tonight are going close to freezing, and it really is too early to put out the warm weather plants. I’m leaving gaps here and there in the annual garden where most of the vegetables grow, to make room for the annual flowers that will be sprinkled between them as soon as the weather is warm enough. It’s soil temperature that matters not afternoon temperature. Tomatoes, Zinnias, Peppers, Dahlias etc. all hate cold feet. Put them in the soil before it has really warmed up and they will just sit there and shiver. I keep busy, actually that’s never a problem in my garden, planting up a variety of containers with vegetables. I’m trying Potatoes in a large terra cotta pot this year. The big question is what flower to put in the centre to make the container slightly more interesting. I have some Brugmansia that a friend gave me that would grow tall and spectacular from the centre of those potatoes and they all belong to the Solanaceae family. Should I be worried that the Brugmansia is somewhat poisonous? My research seems to indicate that it would be quite safe to have them in the same pot so I think I’ll give it a shot. The ever present red Lily bug continues to find its way to the later arriving varieties and seems to have left the earlier ones. 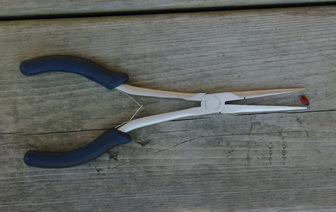 I would like to delude myself that my efforts with my favourite new bug killer, (here is a picture of the whole tool for those of you who didn’t quite understand the partial picture in the last issue of Dallying,) but I know that I have missed a few. Now we need to keep checking the underside of the lower leaves looking for egg masses and then wipe them off before they can hatch into the even more voracious larva. In my garden that is the only insect pest that I worry about at this time of year. There is, however, a bigger pest that has just reached new lows on the annoyance factor. The squirrel, (aka. hairy tailed tree rat,) was spotted in the garden digging in some newly loosened soil. I go and check to find that he has dug up my seed potato piece, eaten the eye out of it and then dropped the rest of the potato piece back onto the soil. Can I move back to the country where it’s legal to get out the 12 gauge? Joyce Asks?Ken, I have used rail ties that are about 20 years old to build my new veggie garden sitting on the ground. i.e. added earth. Do I need to line the sides to prevent the creosote from leaching into the earth and veggies? I wish that I had asked you this earlier as I have had the earth in the rail frame for 3 weeks! Ken Answers! All of my research tends to suggest that the creosote in railroad ties is quite a toxic substance that can leach into soils. Their use for veggie gardens is not recommended. Lining the sides with plastic would certainly help stop any leachate from entering the soil. As your ties are 20 years old, it is possible that anything dangerous may have already been leached out of them, depending on their exposure during those years. Pressure treated lumber is not a good substitute as it also contains some fairly nefarious and leach able chemicals. That’s the info and advice, now you get to make the decision. Enjoy your veggies.